Even though installed windows 8 on one of the laptops quite a while ago, never had a chance to look at all the internals of windows 8 OS and all the software development options. Finally made some time to understand some of these aspects. Here is what I learnt. 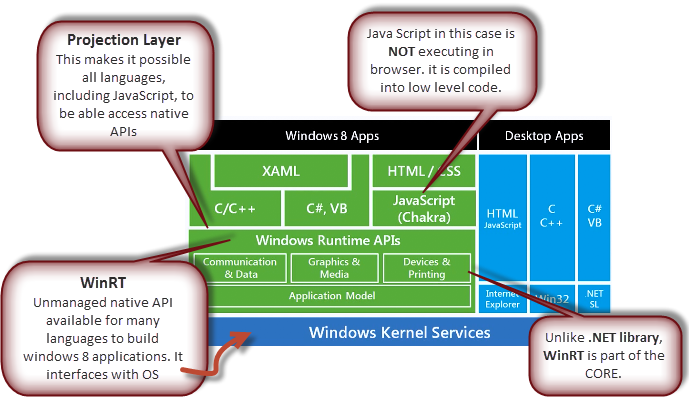 WinRT is an abstraction layer over the OS. But, I found the concept of projection layer to be slightly different from what I was used to. If you already know XAML,C#/VB and/or C++, you can leverage that experience to build windows 8 applications. XAML and C# is going to be my choice.